About six months before my grandmother died, I was sitting next to her on the floral sofa in her sunny basement apartment at my parents' house, looking through a dusty shoebox full of old photos. As the brittle and faded images emerged from the box, they brought with them dozens of stories of small-town life in southern Illinois: high school dances, grade school plays, baseball games, and Sunday afternoons on the porch with fresh-squeezed lemonade and homemade ice cream. But the one photo that I remember most clearly was a black-and-white image on a penny postcard—a solemn full-length portrait of a slender middle-aged black woman in a ruffled satin dress. I turned the card over to check for a name, but the back side, apart from the printed address of a St. Louis portrait studio, was blank. This was the only photo of a black person that I had pulled from the entire shoebox, and I wanted to know more. Who was she? Grandma took the photo in her arthritic fingers. She considered the photo quietly for a moment, the sound of a clock quietly tsk-tsking on the side table. I could smell her faint perfume mingled with the Bengay she rubbed daily onto her aching joints. Then she cracked a thin smile and began her story. The woman's last name was Smith (that's all I can remember now), and she had been a friend of Grandma's mother, my great-grandmother. Miss Smith had grown close with the family—working for them as household help—back in Missouri when both my Great-Grandma McCreight and Miss Smith were young women. After my great-grandmother married, Miss Smith remained single and continued to live and work in St. Louis, but she corresponded regularly with my great-grandma for many years. Eventually—close to twenty years later, I would guess, when my grandmother was in high school—the letters from St. Louis stopped coming. My great-grandmother was concerned by the silence and wrote Miss Smith to find out if something was the matter. Miss Smith, it turned out, had fallen very ill and was now facing a long, slow recovery during which she was unable to earn enough money to live on. "Well, of course Mother asked her to come and live with us," my grandma told me. But Miss Smith resisted the invitation for weeks, maybe months, until at last she was no longer able to put food on her own table. Then she moved to Marissa, Illinois, to live with my grandmother's family. "We just loved her," my grandma said. "We really did!" "We really did!" She said it with emphasis, as though it might come as a shock to me. And it probably was a shock to the people that lived around her childhood home. As you can imagine, in a southern town in the mid-1930s, not every citizen did "just love her." Grandma's father was well respected in the community. He served as the postmaster, appointed by President Calvin Coolidge himself, and just about everybody knew him. His family, with its collection of freckled redheads, was a fixture in town. People liked them. But the town ordinances specifically forbade black people from taking up residence within city limits—even, apparently, as house guests. Some of the neighbors must have complained because my great-grandfather had to go before the city council to obtain a special provision that would allow Miss Smith to live with their family. 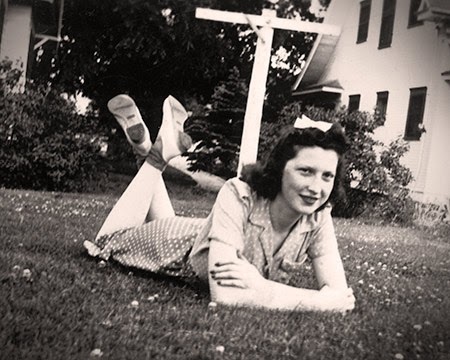 Grandma said that over time "everyone" fell in love with Miss Smith, once they got to know her. Perhaps it was true. Perhaps. I hope so. But the fact remained that she was the only legal black resident of Marissa, Illinois, at that moment in history. The only one. And only on account of a special legal exclusion granted to my grandfather. Honestly, it's hard to believe that everyone "fell in love" with Miss Smith the way my grandma remembered it. My grandmother was hardly more than a child at the time, and both the region and the era suggest that not everyone would have tried to get to know Miss Smith, let alone welcome her with open arms. And who knows what head shaking and finger pointing took place behind the family's backs? Miss Smith lived in the McCreight family home for an extended period—for well over a year. All six kids, my grandma said, adored her. My great-grandparents loved her. She was a tremendous help and comfort to my great-grandmother who suffered from debilitating asthma attacks. She was an old and dear family friend. And yet… She lived upstairs in the hot, drafty attic by herself. Grandma said they tried to give her a better room in the house, but she wouldn't take it. And at family meals, Miss Smith could not be convinced to sit with them. Only on special occasions would she join the family at the table. Sometimes, my grandma recalled, Miss Smith would sit on the floor when there weren't enough chairs. "I just couldn't understand why she would do that!" Grandma said with a chuckle. “Dad would offer her his chair. We always told her to come have a seat with us! But every time, she'd say, ‘Oh, no. I know my place. I know my place.'" That phrase, “I know my place," was, for me, the hardest part of the story to hear. My grandmother shook her head at it, unable to understand, all those decades later, why this house guest of theirs would choose to say such a thing. To her it seemed a little funny—a personality quirk, perhaps. But it made me wonder why my grandmother's family, for all their kindness, did not insist that Miss Smith sit with them at the table. Why did they not downright forbid a clearly unhealthy woman from inhabiting the most miserable room in the house? Why, if they truly loved her, did they not take her by the hand and lift her off of that floor and give her that chair and refuse to take no for an answer? Miss Smith said she knew her place, and my great-grandparents did not—or could not—help her to un-know it. Everybody "just loved her," but she still had no seat at the family table. A year or two later, after her long recovery, Miss Smith returned to St. Louis and continued to write letters for a while, but she eventually lost touch with the family. Grandma never heard what became of her. But I wish I knew. Did she eventually marry? Did she have any children of her own? Are some of her grandchildren or family members still living right there in Missouri? Living, perhaps, in Ferguson at this moment? What small part, for good or ill, might my grandma's family story have played in the greater narrative of the events that happened there this year? And what small part will the words and actions of my own family play in events yet to come? My grandma's family was, I realize, more welcoming than many white families would have been at that time and in that place. But their love, it seemed, was incomplete. At the end of the day, Miss Smith still knew, or believed she knew, that she was not truly welcome. Not really at home. Not fully party of the family or the community. That phrase, "I know my place," remains a painful echo from my own family history—a history that is not, after all, quite as distant as I might wish it to be.